It is a revolutionary sun protection formulation which combines broad-spectrum UVA and UVB protection with skin lightening ingredients to give a uniform matte finish to the skin. Its fast absorption and non-greasy formula ensure a shine-free, light and clean feel. 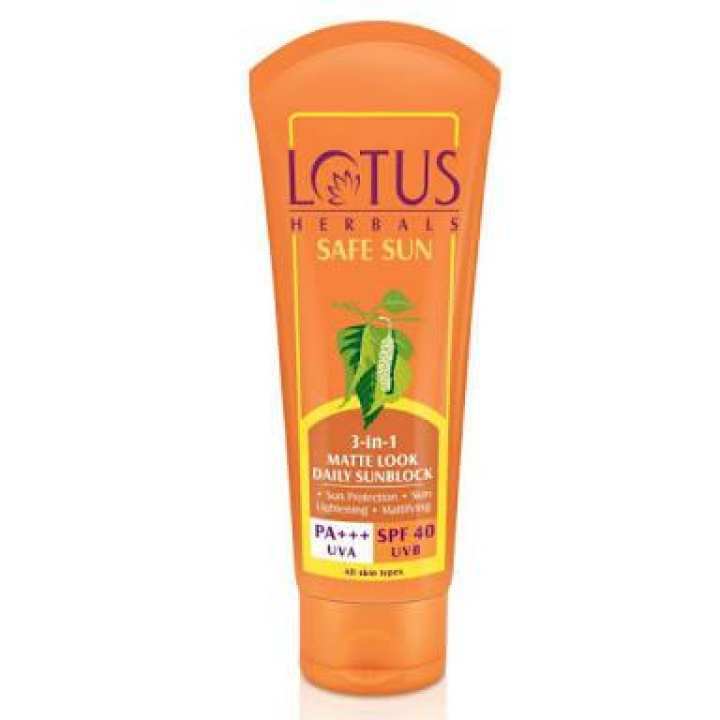 Protect your skin from the harmful rays of the sun with the Lotus Herbals Safe Sun 3-in-1 Matte Look Daily Sunblock SPF 40 100 g. Suitable for all skin types, this sunscreen is must-have for every woman. The birch extract of this Lotus 3 in 1 matte sunscreen refines the pores of your skin and reduces oiliness. With mallow and hops extracts, this sunscreen has a soothing and firming effect on your skin. Whether you are heading out to the beach or traveling to work, the Lotus matte-look sunblock SPF-40 will let you breeze through your day without working about skin darkening.